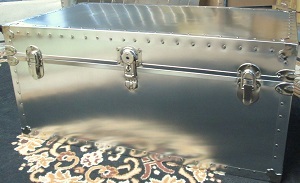 This is the original shipping trunk version made of embossed metal and riveted metal reinforcements. These trunks have been shipped abroad for over 40 years, passing any physical shipping test imaginable. Customers have shipped them to islands in Greece, the African continent and all parts of Europe and South America. They have weathered through container consolidations, to receiving customs house facilities abroad, and loaded on trucks to some of the most remote destinations in the world. All in all, goods arrive safely and unscathed. The emobossed surface is doubly strong for the contents and mainting the safety and integerity of the of goods packed inside. 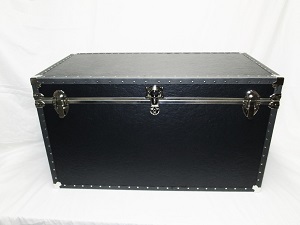 This shipping trunk is 44 inches long, 25 inches wide, and 25 inches deep. This is an in store item only product and you can call in for pick-up or delivery.